This study considers what we call the "degree of optimality" of quota assignments for each OPEC member country based on certain proposed fairness "factors. We argue that these factors should ideally be based on energy and economic conditions that ought to be taken into consideration when production quotas are assigned. Thus, in this study, importance weights based on proven reserves, available productive capacity, GDP per capita and domestic investment needs are first obtained for allocating fair quotas to each member country in the period 1982-1990. Then a degree of fairness optimality index is computed for each member country and is applied to measure the performance of these countries during the quota system period. Our investigations reveal that OPEC appears to give greater importance to the energy factors, proved reserves and productive capacity, although domestic investment needs seem to play a significant role in determining the direction of quota assignments. Statistical tests reveal that all the weights are consistent over time. Finally, we observe that the member countries whose ideal quotas are based on low GDP per capita have higher degrees of optimality than those whose ideal quotas are based on proven reserves or available productive capacity. The computed importance weights and optimality measures can be used both by OPEC and energy analysts interested in OPEC behavior. Energy conservation regulations, such as fuel taxes and fuel economy mandates for automobiles, are often assumed to reduce air pollution in lock step with the reduction in fuel consumption. Under the current system of tailpipe emissions regulations in the United States, this is not necessarily true. This paper uses a simple graphical analysis to illustrate the relative impact of fuel taxes and fuel economy standards on pollution levels given the current tailpipe emissions standards and an alternative emissions standard. Under current tailpipe emissions standards, increases in fuel economy would actually raise emissions, and significantly larger fuel taxes would be required to achieve the same level ftollution reduction as under the proposed alternative standard. These results confirm earlier findings that used mathematical and stochastic simulation methods to address this issue. Cross-section data on investment in back-up generators and uninterruptable power supplies (UPS) are used to infer the implied cost of electricity outages in the business and public sectors in Israel. Two-limit tobit models of the demand for back-up are estimated and used to simulate the mitigated and unmitigated cost of power outages. These "revealed preference estimates of outage costs are then compared with estimates based on the method of subjective evaluation. This paper describes a private franchise approach to long-term custodial care, monitoring and eventual cleanup of hazardous and nuclear waste sites. The franchise concept could be applied to Superfund sites, decommissioning commercial reactors and safeguarding their wastes and to Department of Energy sites. Privatization would reduce costs by enforcing efficient operations and capital investments during the containment period, by providing incentives for successful innovation and by sustaining containment until the cleanup's net benefits exceed its costs. The franchise system would also permit local governments and citizens to demand and pay for more risk reduction than provided by the federal government. In principle, they would have the option of taking over site management. The major political drawback of the idea is that it requires society to be explicit about what it is willing to pay for now to protect current and future generations. Natural Gas in the U.S.: How Far Can Technology Stretch the Resource Base? 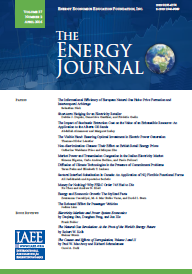 We review the theoretical underpinnings of the exponential model, the amount of gas discovered per unit effort, a quantity called yield-per-effort (YPE), and estimate an econometric model that represents the historical determinants of the YPE for nonassociated gas discoveries in the lower 48 states from 1943 to 1991, the entire period for which the requisite data are available. Results indicate the YPE declines as the exponential function of cumulative drilling when short run changes in drilling effort, real gas prices, and shifts between onshore and offshore are accounted for. We explicitly test and reject the hypothesis that technological change has arrested or reversed the long run decline in YPE. We also discuss some alternative models of YPE that misrepresent the interplay of depletion and technical innovation, as well as the process of innovation itself, and the statistical and methodological shortcomings of the empirical analyses used to support several alternative models of YPE. According to Weiner (1991), the world oil market is said to be unified' if prices for same quality crude oils from different regions of the world move together and regionalized otherwise. This hypothesis of Weiner is kept unchanged. However, we are more interested in the efficiency implications of a regionalized world oil market than its policy implications as discussed by Weiner. Specifically, if these prices deviate from each other, i.e., the market is fragmented, there will be arbitrage opportunities for crude oil traders which would render the market inefficient. In this paper, the regionalization hypothesis is investigated via cointegration tests using both spot and contract prices for fifteen crude oils. Three groups of similar quality crudes are formed based on API gravity and sulfur content. Tests of cross-group co-movement which provided evidence for significant quality differences between heavy and light crudes further supported our groupings. Then the co-movement of prices is tested within each group. The crash in 1986 is explicitly dealt with following methods described in Perron (1989). Results indicate that the world crude oil market is unified over the 1980-95 period.